You are here: Home » Endless miles. Pink tennis shoes. A man on a mission. Pete Miller is on a mission to make sure his three granddaughters never have to experience breast cancer. His eyes light up when he talks about family – his wife, two daughters and granddaughters. “I’m surrounded by women,” he jokingly says. In 2001, their family life was abruptly interrupted when daughter, Kim, was diagnosed with breast cancer at 33-years-old. Watching daughter Kim face breast cancer, Pete wanted to take action. And he did. 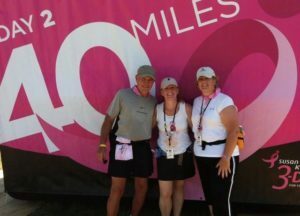 Since 2006, Pete has raised nearly $40,000 and participated or volunteered in thirteen Susan G. Komen three-day events in multiple cities across the U.S. Each three-day participant walks 60-miles and commits to fundraising more than $2,000. Pete has walked or assisted in three-day events in Cleveland, San Diego, Denver, Arizona and the Twin Cities. For several events, Pete was part of the extensive team of volunteers that form a crew to oversee and manage select operations and logistics for hundreds of participants. He even created his own 56-page Three-Day Participant’s Guide to provide helpful tips for others on what to expect. His grueling 24-week training schedule and one 3-Day event totaled 630 miles. 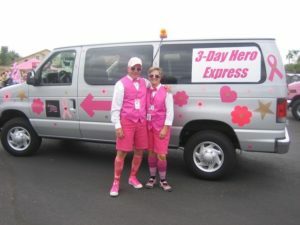 Pete says you’ll find him by looking for the pink tennis shoes and ‘Team Ladybug’ pins in honor of his daughter. Pete and his family are More Than Pink™ and we recognize the tremendous impact they’ve made in the fight against breast cancer. 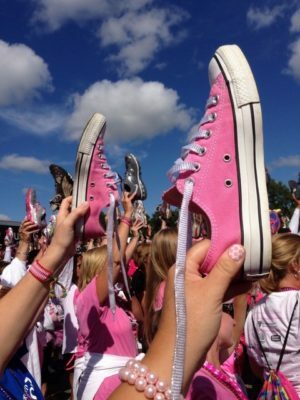 Every step, every voice, every dollar helps us get closer to a world without breast cancer.